The weather is starting to turn and spring is beginning to show her face. Hurray! Now’s the time to get out, get moving, and reintroduce yourself to New York City. Check out some of these easy-to-access destinations that will quickly remind you of the beauty in this part of the world. Although it’s just a subway or tram ride away, Roosevelt Island feels like an entirely different world. 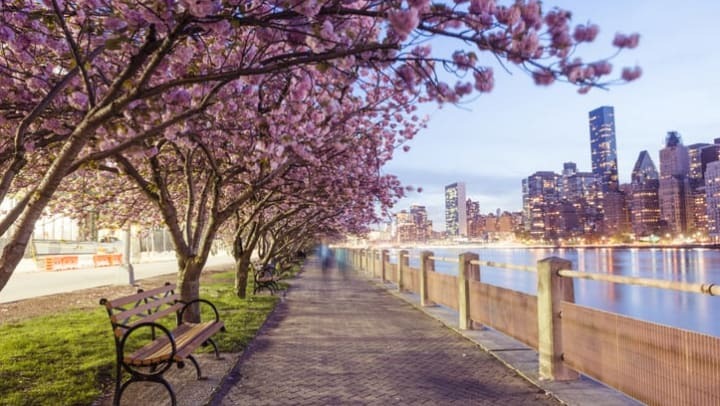 Situated in the East River between Manhattan and Queens, Roosevelt Island has a beauty and calm about it that makes it the perfect getaway from the frenetic pace of the city. A tram ride will allow you to see the gorgeous views of the city, as well as the green spaces you are about to discover, such as Franklin D. Roosevelt Four Freedoms Park on the southern end of the island. The free Red Bus will transport you from one historic location to the next, including a smallpox hospital (now on the National Register of Historic Places), The Octagon landmark (formerly an insane asylum), and the Chapel of the Good Shepherd. To catch the tram home, just make sure you’ve made your way back to the station before 2 AM. It’s typically a sea of flowering pink from late March until mid-May at the Brooklyn Botanic Garden. You won’t want to miss this cherry blossom display, especially after a long NYC winter. The Seasonal Highlights Tour (free with Garden admission) begins April 2 – prepare to be dazzled by gorgeous pink petals raining down throughout the Japanese Hill-and-Pond Garden and Cherry Esplanade. The actual festival takes place April 27 and 28 and is a gorgeous celebration of Japanese culture. Take in Taiko drumming, Kabuki Buyo dance, the Manga maven show, or the Sohenryu tea ceremony. Before you go, check out CherryWatch on the garden’s website – you can see how the blooms are looking before you visit! If you are looking to venture further from the city, take a road trip west to the Poconos and become one with nature. About 120 miles from NYC, the Poconos offer something for everyone, from historic bike paths meandering through the landscape, to whitewater rafting that’s not for the faint of heart. There’s even bird watching for those hoping to see species they can’t glimpse in the city. Kids and adults alike will enjoy hiking to Raymondskill Falls, the tallest waterfall in Pennsylvania, and Dingmans Falls, the second-highest waterfall. Don’t forget to stop by your unit on the way out of town to load up your bikes, packs, and helmets. For more great New York City activities, head to our blog.